FJowners.com > General Category > Modifications > pucks or crash bars? Re: pucks or crash bars? I prefer to call them engine/case guards but the Renntec bars from RPM are worth every cent spent. I have seen them put to use so much on one FJ they had to be welded to close up the tubes. Every time the FJ was still ride-able and got the owner home. How much will a tow truck cost? The hassle of getting your bike home on a trailer? I have had a few zero speed drops and one low speed slide on mine. Worth the cost by way more than I spent. Any protection you can add is good. Along with my particular tire pressures, I stick with those solid engine bars, DID chains, Michelin tires, RPM fork braces, RPM valves and blue dot calipers. Now you know the winning formula. The renntec bars are the go to protection for the FJ engines. As shown in earlier comments, they are well worth the investment. I work nights and once or twice a year do extended rides well into the night. 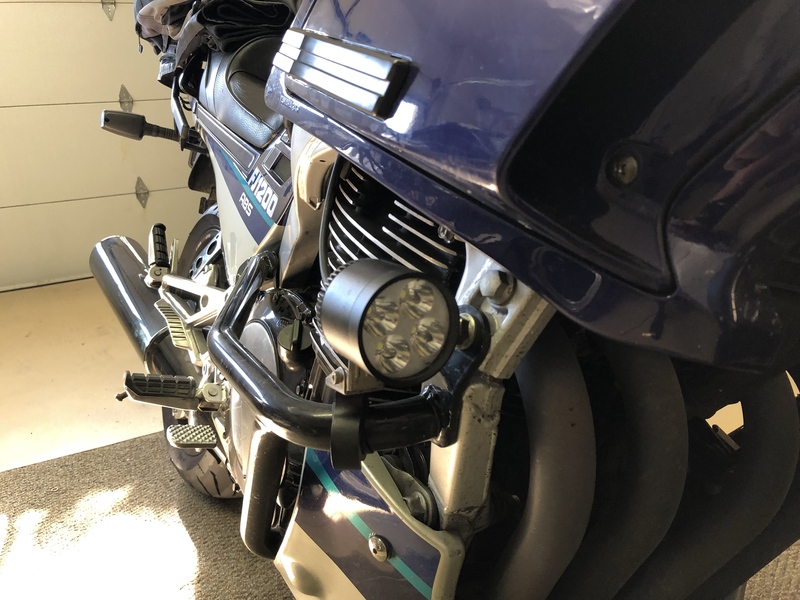 They Renntec bars are a great place to mount Auxiliary lights. cool who takes the pictures? During FJ Rally's, it has been known that fellow owner or a Pillion rider will position themselves ahead of a ride group and take photos as riders pass by. In this case, there are a few destination roads that are real curvy and attract a lot of riders. Online based photography company's station professional photographers at multiple corners on these very popular roads. You ride the road, the photographers take photos of every vehicle that comes along and later in the day post the photos on their website. You go to their website and find photos of yourself. Pay a fee and download the photos. I will "Third" those Renntec Crash-Bars..................Allowed me to ride my FJ back to the Hotel, and then 4-hours back to my Car/Trailer after my "Crash"
What a memory that was! "I want to be free to ride my machine without being hassled by the "man"! Shift worker here too... Oh, and you only need to drop the bike on it's side once to convince you the bars are the way to go. That was a Cold, Foggy ride back to Iowa! Engine bars every time for me. My mate Linda managed to slide my 3CV down the road at around 30mph a few years back. As well as saving a severe dose of 'Gravel rash' to the (L/H) signal cover, they held the downed bike up off her left leg, enabling the bike to slide away from her as her bike trousers slowed her down. We dusted her down, picked the bike up, she got back on it and rode it home. I can't ever imagine 'pucks' giving that level of protection. Oh, and as mentioned above, they're good for fixing farkles to. They're in stock. Someone started two carts and added them every time to the new cart. They completed one cart so I have deleted the other cart they started. There is a set on the shelf. Plus, we order Renntec every week. So unless they are on back-order from them they are never more than a week away. Done, got the fork brace as well, i have the double banjo for the front brakes at the tree, will the brace slam into that anytime soon? will the brace slam into that anytime soon? On my 89 model, I had installed the RPM fork brace after I had installed upgraded brake components. With the Stock forks and probably the original forks springs, the Horn/bracket did make contact with the fork brace under heavy braking. Enough so that the horn bracket broke. This is not to say that anything is wrong with the RPM fork brace, or it's design. 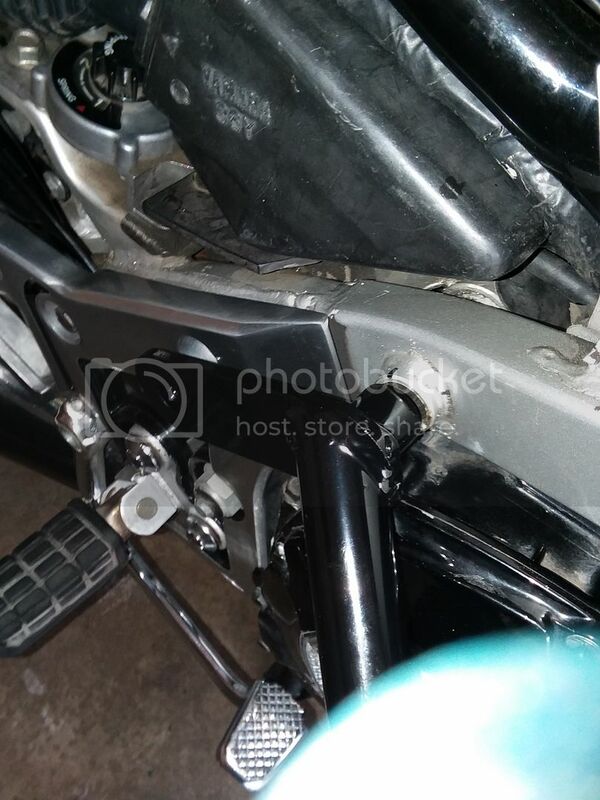 The Horn/bracket contacting the fork brace showed me 2 things. 1st, The brake upgrade that I did actually provided better stopping power by collapsing the fork springs enough to make contact. 2nd, It showed me that the springs were worn out and needed to be replaced. I installed a set of .85kg Race Tec springs and the RPM fork valves. Problem solved. Randy sent me pictures of them mounted, anyone can send me a picture of what it should look like? They will fit fine. Just start all the bolts so all are loose , then start evenly tightening all of them. 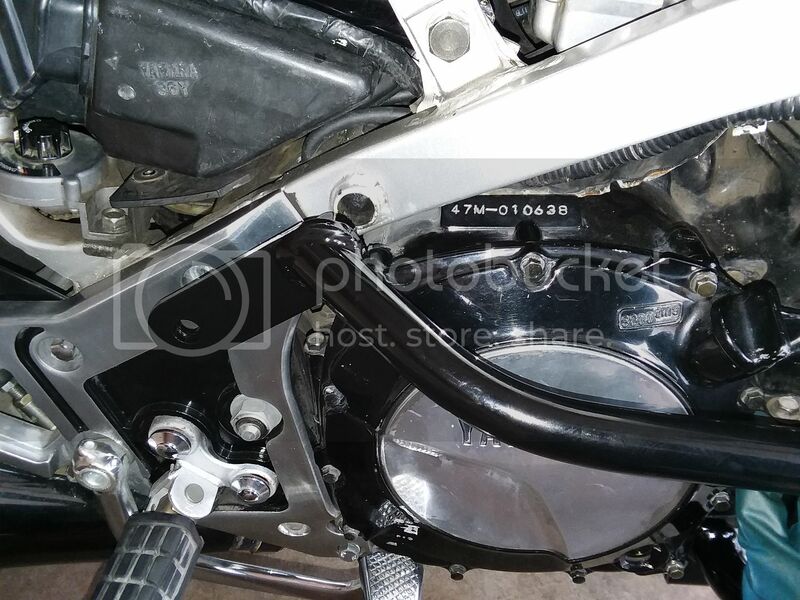 The rear plate section that you are concerned with will conform/bend slightly to fitup to the frame. That is my experience with installing them on my '85.